Clothes dryers are pretty simple machines that use a fuel source to heat air and a motor and fan to blow it around. Here are some tips to help you troubleshoot when your dryer isn't working properly, no matter what brand it is, and make some simple repairs. These may save you the expense of a service call or eliminate some issues so the problem is easier for the technician to solve. If the dryer won't start, check to be sure that the dryer is plugged in. This seems so simple but you don't need a repair technician to do it. Plugs can get bumped loose by animals or fallen objects. If that doesn't work, move on to the next item on this checklist. Once you've made sure the dryer is properly plugged into the electrical outlet but it still won't run, it's time to check your central home electrical box to see if a fuse has blown or a circuit breaker has tripped. You may be able to replace the fuse or turn the breaker back on. This is a good time to check the voltage in the outlet with a voltage meter. Both electric and gas dryers require 240 volts to operate. Be sure that your outlet is functioning properly. If not, call an electrician immediately! Dryer power cords can also fail. Check the voltage and replace if needed. If you have a gas dryer be sure that the pilot light is lit and that you have an adequate supply of gas if the dryer is fueled with liquid propane. If you have had a power outage or surge in your home, it is possible that the thermal fuse in the dryer control panel is damaged. The thermal fuse "blows" if there is overheating or a surge of power and prevents the dryer from catching fire. This is a very good thing! The fuse is inexpensive and easy to replace yourself. Dryers require a door switch to engage for the appliance to work. These switches can break and have to be replaced. They can also just get coated with lint. Use a cotton swab and a bit of rubbing alcohol to clean the contact areas. If the dryer heats but the drum doesn't turn, check the rubber belt that connects the motor to the drum. It may be loose or broken and is inexpensive and usually easy to replace. If a dryer turns on and then shuts off very quickly (under 5 minutes or so), it is usually a problem with either the thermostat or thermal resistor. The thermal fuse "blows" and turns off the dryer to prevent overheating. You can check the temperature sensor with a voltage meter to determine if it is working properly. While you're checking these elements, also check the heating element and timer to be sure they are receiving power. Check the user or repair manual. Finally, replace that thermal fuse because it has probably blown when the problems began. Stop the drying cycle and check inside. Are there coins, cell phones, or keys taking a spin? Remove the offenders and the noise should stop. If your dryer is still noisy and vibrates, it is off-balance. You must take steps to level the dryer or it will never be quiet and further damage to the structure can occur. If the dryer is making screeching or squealing noises, the problem is worn drum bearings or supports. Unless you are very handy with tools, this will require a repair technician because the entire unit must be disassembled. If it takes forever for a load of clothes to dry and your clothes come out covered in lint, clean out that lint filter! If the lint filter is full, air is not flowing freely and your machine is forced to work longer than necessary. After you empty the filter, give it a good cleaning to get rid of any residue from dryer sheets. You should also use a bit of rubbing alcohol to clean the electronic moisture sensors (one or two little metal strips inside the dryer drum). You'll get your dryer working more efficiently and prevent a possible fire. If your filter is clean, and the dryer is heating up but it is still taking too long to dry clothing; there are two things to check. Is the dryer vent system kinked, clogged, or disconnected? Use at long-handled bristle brush to clean out the dryer vent. The vent should be as short as possible between the machine and the outside exhaust vent to prevent clogs. If the venting system is long and you can't reach the entire length with a brush, use a leaf blower to clean the system or hire a professional. If you still have a flexible white plastic dryer hose, replace it! It is a fire trap waiting for disaster which is why new building codes require a rigid dryer vent. Now, go outside and check the outside vent. Most are designed with a trap door that only opens when dryer air and lint are blown out. If the vent hood gets coated with lint, the trap door can't open. This is often a problem in high humidity climates. Check it every few months, you'll be amazed at the amount of lint you find. You've checked everything. If you've kept the operating manual, get it out and read it! You may just find the answer to your question. If you don't have the manual, visit the manufacturer's website. It may take a little time but it's much less expensive than a repair call. One last thing to do before calling a repairman is to visit online appliance repair sites such as RepairClinic and FixItNow. 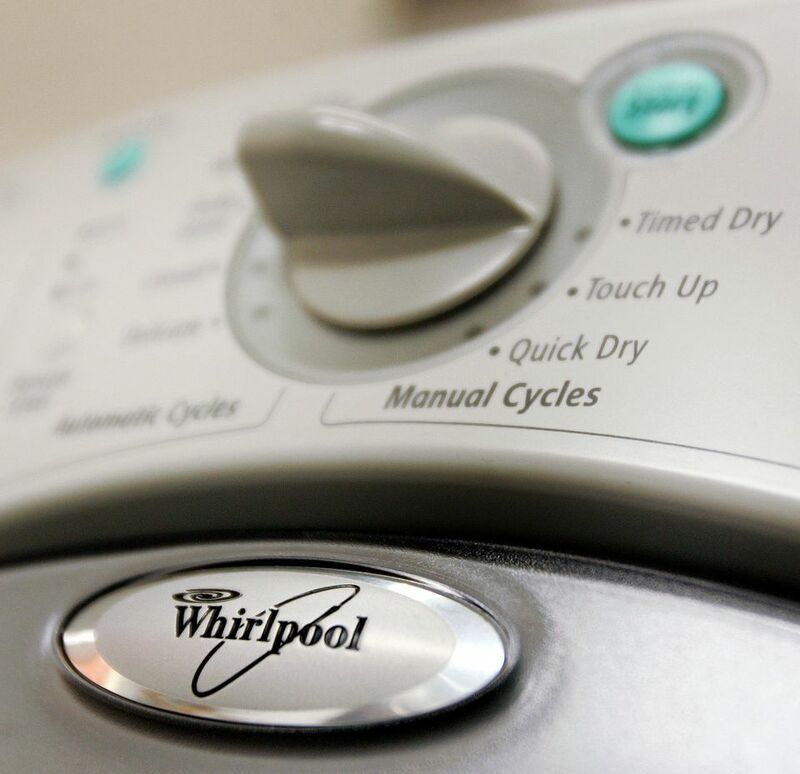 Or, take a look at specific problems/solutions for Whirlpool Duet Dryers, Whirlpool Cabrio Dryers and gas dryers.